We’re expecting the flagship Nokia 8 to land soon, but it seems the new Nokia phone arm (run by HMD Global) might have got a bit ahead of itself, as the company posted the name and an image of the phone on its official Chinese website. It was quickly removed, as you’d expect, but not before a member of Tieba Baidu screen grabbed it. So, what can we take from the image? Firstly, that the phone is indeed called the Nokia 8. And secondly that, as shown, it will have an edge-to-edge screen with large bezels above and below, the lower of which houses a home button and fingerprint scanner, flanked by back and recent apps keys. We can’t see the back of the Nokia 8, but the side looks to be slim, curvy and probably metal, in a blue shade. In fact, it’s exactly the same design as was recently leaked, suggesting that, although we can’t see them, the Nokia 8 will have dual-lens cameras, as shown in that earlier leak. 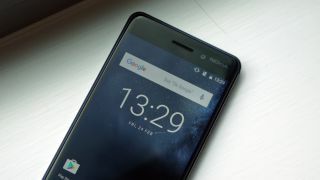 Since we only have a screenshot of the Nokia page to go on it’s possible that it’s been doctored, but it certainly looks convincing and lines up with what we’ve seen and heard before, so this is probably your first somewhat official look at the Nokia 8. And you should get a much closer look soon. The phone, which is also rumored to have a Snapdragon 835 chipset, 4/6GB of RAM and a 5.3-inch 2K display, is rumored to be getting announced on July 31, so less than two weeks from now. But it may land even sooner, as the display in the image above shows today's date (July 20). And even if that's not accurate, with Nokia already accidentally listing the phone it’s likely that the announcement will happen very soon. An even higher end Nokia 9 might be in the works.